Fans 21+ can explore the enormous Bourbon World presented by the Louisville Courier Journal. With 95% of the world’s bourbon coming from Kentucky, festival producers Danny Wimmer Presents have hand-selected expressions from the top distilleries to create a unique opportunity to enjoy bourbons and exclusive one-time specialty cocktails inside what may be the World’s Loudest—and Largest—Bourbon Tent. Site-wide, an enormous selection of bourbons will be available. Participating bourbon brands include: 1792, Angel’s Envy, Barrell Bourbon, Basil Hayden’s, Bloody Butcher’s Creed, Booker’s, Boone County Distilling, Bowman Brothers, Buffalo Trace, Bulleit, Contradiction, Cooper’s Craft, Eagle Rare, E.H. Taylor, Elijah Craig, Elmer T. Lee, Evan Williams, Four Roses, Jefferson’s, Jim Beam, Jim Beam Black, Kentucky Owl, Knob Creek, Larceny, Maker’s 46, Maker’s Mark, Michter’s, New Riff Bourbon, Old Forester, Peerless, Rabbit Hole, Rebel Yell, Rock Hill Farms, Wild Turkey, W.L. Weller, and Woodford Reserve. Additional featured spirits include: Jack Daniel’s, Uncle Nearest Whiskey, Southern Comfort and Tito’s Handmade Vodka. The Louder Than Life food and beverage options will be provided by Southern Hospitality Concessions LLC, DWP‘s affiliate concessionaire. Festival attendees will be able to experience a taste of Louisville. Selections from the following local and regional restaurants will be available: Bouquet, Boss Hog BBQ, Cellar Door Chocolates, Doc Crow’s Southern Smokehouse & Raw Bar, Citizen 7, Gospel Bird, Longshot Lobsta, Mike’s Kentucky Kitchen, Midway Café, Tumbleweed, 502 Café, and Whiskey Dry. 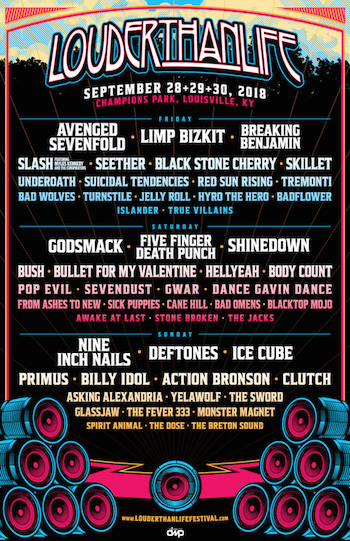 Tagged Action Bronson, Asking Alexandria, Avenged Sevenfold, Awake At Last, Bad Omens, Bad Wolves, Badflower, Billy Idol, Black Stone Cherry, Blacktop Mojo, body count, Breaking Benjamin, Bullet For My Valentine, Bush, Cane Hill, Clutch, Dance Gavin Dance, Danny Wimmer Presents, Deftones, Five Finger Death Punch, From Ashes To New, Glassjaw, Godsmack, GWAR, hellyeah, Hyro The Hero, Ice Cube, islander, Jelly Roll, Limp Bizkit, louder than life, Louisville, Monster Magnet, Nine Inch Nails, Pop Evil, primus, Red Sun Rising, Seether, Sevendust, Shinedown, Sick Puppies, Skillet, Slash featuring Myles Kennedy & The Conspirators, Spirit Animal, Stone Broken, Suicidal Tendencies, The Breton Sound, The Dose, The Fever 333, The Jacks, the sword, Tremonti, True Villains, Turnstile, underoath, Yelawolf.